The Velothi Mountains separate Morrowind from the provinces to the west, and it has developed a unique ecosystem. The passages between them, like Dunmeth Pass, are important trade routes. The southern Deshaan plain slopes downwards to the border with Black Marsh. On a clear day, denizens of Mournhold can see the peak of Red Mountain about 250 miles away (though the exact definition of a mile is unknown). The eastern lands have been subject to great volcanic activity, and Morrowind shows the signs of this clearly. Cloud movement shows that Morrowind predominantly has upper-level southerly winds, resulting in a mild, though often hot, climate. Morrowind is free from snow and ice (besides Solstheim), unlike other parts of Tamriel at the same latitude. 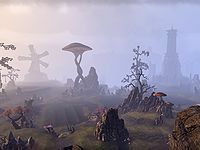 Mainland Morrowind consists of the Morrowind half of the Velothi Mountains, the fertile Deshaan plain (which includes swamps), and the mountains comprising the northeastern peninsula of the province which partially wraps around Vvardenfell and the Inner Sea. The city of Blacklight, a Redoran stronghold, is located in the northwest, near the Dunmeth Pass. Mournhold and Narsis lie near the middle of the southern mainland, Tear is in the southeast corner near the border with Black Marsh, Kragenmoor lies in the southwest corner near Cyrodiil, and Necrom is found on the eastern coastline. The Clockwork City of Sotha Sil was secretly located deep beneath Mournhold in 2E 583; contradicting rumors placed it in Morrowind's hot southern swamps, and beneath Ebonheart, though given the city's diminutive size, it is possible it was moved to various locations over time to ensure its safety. Mainland Morrowind is divided into several regions, among them Bal Foyen, Stonefalls, and Deshaan. Bal Foyen is a tiny, swampy region on the southeastern shore of the Inner Sea, situated between Stonefalls and the northeastern peninsula. The region contains the town of Dhalmora and Fort Zeren. Stonefalls is a region situated along the southwestern shore of the Inner Sea. It borders Bal Foyen to the east, Deshaan to the south, Cyrodiil to the west, the Rift in Skyrim to the northwest, and the Morrowind part of the Velothi Mountains to the north. 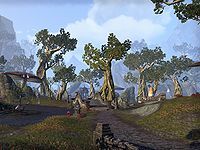 The region contains the cities of Davon's Watch, Ebonheart, and Kragenmoor. Other notable places include the necropolis of Othrenis and two great volcanoes, Ash Mountain and Tormented Spire. The region's landscape fluctuates from volcanic crags to fertile fields and fungal forests. Deshaan is a southern region of Morrowind, situated between Stonefalls, Cyrodiil, Shadowfen in Black Marsh, and the northeastern and southeastern coastal areas of Morrowind. The region contains the city of Mournhold, surrounded by Lake Amaya, as well as Narsis on the shores of Lake Hlaalu. It is also home to the magical academy of Shad Astula and the Shrine of Saint Veloth. The region consists of lush green areas, fungal forests, and southeastern swamps. 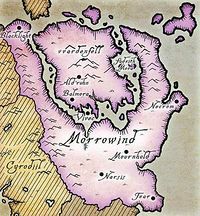 The Telvanni Peninsula comprises the eastern arm of mainland Morrowind, and is bracketed by the Inner Sea to the west and the Padomaic Ocean to the north and east. From the region's name, it is presumably the stronghold of House Telvanni. Gorne is a small island off Morrowind's east coast, near Necrom. Many strange creatures found nowhere else in Tamriel inhabit Gorne. Among them is the Striped Wolf, a breed of giant wolf which terrorized the island's settlers until they were suppressed in an event called the Troubled House Hunt. Solstheim, sometimes misspelled Soulstheim, is a large island in the Sea of Ghosts to the north of Tamriel. It officially became a region of Morrowind in 4E 16. The island has a long history of habitation by other races, but it has traditionally been primarily Nordic in influence. Before the eruption of Red Mountain in 4E 5, the landscape of Vvardenfell was diverse, with the grasslands of the Ascadian Isles and Grazelands, the dry plains of the West Gash, the volcanic crags of the Ashlands, Molag Amur and Red Mountain, and the coastal areas of Azura's Coast, the Bitter Coast, Zafirbel Bay, the Sheogorad region, and Firemoth. 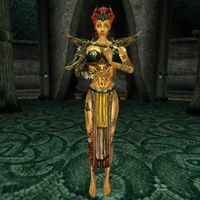 "Dwemereth" had been inhabited by the Dwemer since time immemorial, but the history of Morrowind under their rule is a mystery. When the exiled Chimer led by the prophet Veloth left Summerset Isles and came to what they considered their promised land, they found the Dwemer were already well-established in their underground colonies. The two races would not live in peace, as disputes over land and religion regularly led to conflict. They would, however, unite against a common enemy following almost two hundred years of oppression by the Nords of Skyrim, who invaded the area circa 1E 240. Due to the personal friendship between Indoril Nerevar of the Chimer and the Dwarf-King Dumac of the Dwemer, an alliance was formed between them, and the Nords were pushed out by 1E 416. This alliance born out of need formed the First Council. Nerevar and Dumac ruled jointly over "Resdayn". The peace between the Dwemer and Chimer brought prosperity, but the War of the First Council broke out when relations went sour. It ended with the Battle of Red Mountain, which saw the death of both leaders. Almalexia, Sotha Sil, Vivec, and Dagoth Ur tapped the Heart of Lorkhan to attain god-like powers (though Dagoth Ur would disappear until 2E 882). As a result, the Chimer changed into the Dunmer. Red Mountain erupted (during the battle, apparently), laying waste to half of Morrowind and beyond. 1E 668 is known as "Sun's Death" and the "Year of Winter in Summer". It's believed that this eruption created the Inner Sea and destroyed entire cities, and led to a population shift to the south. It was sometime after this eruption that the land became known as Morrowind. Some sources seem to suggest this name wasn't popularized until the late Second Era. Morrowind under the Tribunal marks the beginning of Dunmeri history. 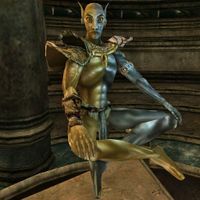 The Tribunal consolidated their power and succeeded in incorporating themselves into the Chimeri belief system of ancestor and Daedra worship, at the expense of the worship of the House of Troubles, who the Dunmer know as the "Bad Daedra". Massive shrines to those four Daedric Princes still dot Morrowind, though at the close of the Third Era, they were abandoned ruins typically inhabited by monsters and criminals. The Tribunal replaced the First Council with the Grand Council of Morrowind, and performed many amazing deeds as the Dunmer's immortal protectors and leaders. 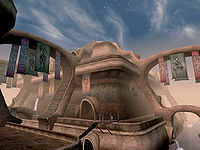 Cyrodiil sought to incorporate Morrowind into the Empire of the Reman Dynasty, perpetrating the bloody Four-Score War, which ultimately ended in a treaty. In 2E 572, the Akaviri army of Ada'Soom Dir-Kamal invaded northern Tamriel. They were defeated at Stonefalls by the combined forces of the Nords (along with Wulfharth Ash-King), Dunmer legions of Almalexia and Argonian Shellbacks. This event led to the formation of the Ebonheart Pact, an uneasy alliance between the Nords, the Dunmer and the Argonians. The Pact later participated in the Alliance War. Much to the surprise of almost everyone, no such conflict occurred at the rise of the Third Empire, and Tiber Septim's ambitions of conquest were fulfilled through diplomacy. Vivec and Tiber Septim reached an agreement in the Armistice around 2E 896. The Dunmer became Imperial citizens and submitted to Imperial occupation and the incursion of Cyrodilic institutions and business interests, but retained self-rule, house traditions, and religious practices. Vivec secretly supplied the Emperor's agents with the golem Numidium as part of this deal. The Dunmer, and the Chimer before them, divided Morrowind into political districts based on their Great Houses. An unknown number of Great Houses rose and fell over the years, but in the late Third Era, House Redoran controlled the western mainland bordering Cyrodiil and Skyrim. House Hlaalu controlled the central-western part of the mainland. House Indoril controlled the central-eastern part of the mainland. House Dres controlled the area forming the border with Black Marsh. House Telvanni controlled the eastern region of the province. For ages, Vvardenfell was a Temple preserve predominantly inhabited by a few Great House settlements and Ashlanders, but it was opened to greater settlement in 3E 414. House Telvanni snatched up the east, House Hlaalu took some of the center and the marshy southwest, and House Redoran held dominion over the remaining areas, though it largely refused to expand settlement. Morrowind under the Tribunal was distinct from most of Tamriel in many ways. For one, their legalization of assassination set them apart. Also, the Dunmer banned necromancy in their land long before the Mages Guild saw fit to do so. However, necromancers could continue to operate secretly thanks to another peculiar Morrowind institution: slavery. For ages, the Dunmer had enslaved humans and elves, but mainly concentrated on beastfolk, namely Khajiit, Argonians, and Goblins. The right to retain this tradition was guaranteed by the Armistice, and it continued for virtually all of the Third Era, mainly due to the lobbying of Houses Dres and Telvanni, and despite the general abhorrence of the institution by the rest of Tamriel. In the final years of the era, the new King Helseth, looking for a way to exert his authority, banned the controversial practice, eliciting an initially bloody reaction. As the Dunmer would find out, though, their transgressions were not forgotten. Dagoth Ur awoke beneath Red Mountain in 2E 882, heralding enormous changes in Morrowind. The Tribunal led campaigns against him and his monsters for over four hundred years. Around 3E 417, the Great Ghostfence was erected to contain the threat, though some sources suggest the Ghostfence existed for centuries before this. The enormous shimmering-blue barrier encircled the entire Red Mountain region of Vvardenfell, but still, Dagoth Ur's monsters and the Blight managed to seep through. With the advent of the Nerevarine in 3E 427, Almalexia, Sotha Sil, and Dagoth Ur were soon dead, and Vivec went missing. The Dunmer were still struggling to come to terms with this at the close of the Third Era. After the Oblivion Crisis, the Nords and Orcs launched attacks. In Vivec's absence, the Ministry of Truth eventually fell, destroying Vivec City and causing Red Mountain to erupt, covering the rest of Vvardenfell in ash and lava. 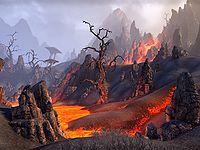 Since this Red Year of 4E 5, Red Mountain has been spewing ash even more regularly than before, and Vvardenfell remains largely uninhabitable. When Solstheim came under Dunmer rule, the Redoran took over its administration, though the Telvanni also established the settlement of Tel Mithryn. The Argonians of Black Marsh, meanwhile, were stronger than ever and soon invaded Morrowind, seizing large tracts of land that had long ago belonged to them. They also sacked many cities, including Mournhold, in southern Morrowind. Though a Redoran army halted their advance, countless Dunmer were killed or displaced, and they were forced to establish dozens of colonies elsewhere, including the island of Solstheim. Apart from organized colonies, many Dunmer refugees have settled in Skyrim, especially in the so-called Grey Quarter of Windhelm. 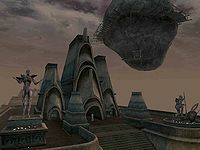 Though Mournhold was rebuilt, the capital of Morrowind was moved to the Rootspire in the Redoran city of Blacklight, as the leadership House Redoran had exhibited had greatly increased their power and influence. The Empire's ineffectual protection and seeming indifference to Morrowind's plights made them reviled by the Dunmer. 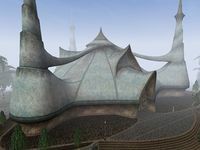 After the Empire "released its grasp" on Morrowind, House Hlaalu's Imperial ties resulted in it being replaced by House Sadras on the Council of Great Houses. The largest plantlife in Morrowind is the mighty emperor parasol mushroom, a fungus the size of a tree. They dot the landscape of Morrowind, particularly in Telvanni regions. Other types of fungi include bloatspore, bungler's bane, hypha facia, luminous russula, and violet coprinus. 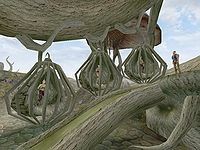 Much of the flora of Morrowind must be adapted to its harsh environment, like the black lichen, fire fern, and chokeweed, which are found in many rocky, infertile areas. 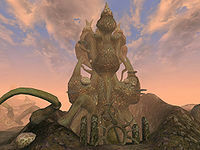 Kreshweed and Saltrice appear to thrive in salt water, and can be found along Morrowind's extensive coastline. Some plants haven't adapted and thus are rare, like red and green lichen. The Dunmer have managed to make do with what they've been given. They have domesticated many plants, such as scrib cabbage plants, which are commonly grown within indoor planters. Wickwheat is an edible grain that grows in the wild. Saltrice is both an important food crop and the main ingredient in the popular alcoholic beverage mazte. Muck is prepared from the common muck sponge plant. The roots of Trama shrubs are used to make tea. The berries of the comberry plant are edible, though they are known for their bitterness. Something tastier, like the hackle-lo leaf or marshmerrow pulp, are more preferred. Corkbulb is grown because its tough roots are used for construction in lieu of large amounts of wood. Dunmer have long made ash yams a staple of their diet, as the hardy vegetable can thrive when planted in ash (hence its name). Some of their vegetation is sought for the alchemical ingredients they offer, such as draggle tail, the moss of an emperor parasol, meadow rye, nirthfly, roobrush, scathecraw, slough ferns, spike grass, spiny lloramor, and sweetbarrel. Flowering bittergreen vines can be found in wet and dry regions alike. Various other flowers include the black anther, gold kanet, golden sedge, heather, horn lily, noble sedge, stoneflower, timsa-come-by, and the willow flower. Silt Striders, netches, and guar are some of the most iconic beasts of Morrowind. But not to be forgotten are the kwama, enormous cave-dwelling insects in Vvardenfell whose eggs the Dunmer have made an industry of "mining" for food. Slaughterfish and dreugh fill the waters of Morrowind, and mudcrabs line the shores.Bothersome cliff racers dominate the sky in numbers so great they are said to have driven off the dragons (though the racers themselves were purportedly driven from Vvardenfell by Saint Jiub). The large, black shalk bugs in the wilderness can attack with magical fire if threatened. Various Daedra can be found roaming the landscape, such as the Winged Twilight, along with various ash creatures and more natural beasts like the alit, kagouti, and packs of nix-hounds. Goblins have been known to inhabit the depths of Morrowind, where they kept durzogs, ferocious dog-like reptiles, as patrols and war animals. And, like virtually every other place in Tamriel, rats are common. The island of Vvardenfell used to hold more unique animals such as the Cliff Strider, the Nix-Ox, and Vvardvark, but by the late Third Era, Ash Blight had wiped them out. Another Exotic thing even among the alien wildlife in Morrowind is the bizarre, bioluminescent, and possibly sentient Land-Coral species that grows on the land around the Inner Sea of Mainland Morrowind and Vvardenfell. Redoran style, with organic, crab-like houses. This style was present in Vvardenfell in the Second and Third Eras. Hlaalu style, with simple, cubic stone houses. This style was present in Vvardenfell in the Second and Third Eras. Telvanni style, with bizarre, twisted mushroom towers and dwellings. This style was present in Vvardenfell in the Second and Third Eras. Velothi style, which is seen in ancestral tombs, ancient towers, and Temple buildings. Responsible Architecture, a style that originated in the First Era and is attributed to the Daedric Prince Boethiah. This style was similar to that seen in various Daedric ruins in Morrowind, and it was used by the famed architect Guylaine Marilie to build a prison to contain Daedra at the site where Fort Arand was later constructed. An unnamed style, featuring ornate stone buildings with peaked, shingled roofs, was common in mainland Morrowind in the Second Era and even extended into Cyrodiil. The city of Mournhold retained the style in the Third Era. The Imperial settlements founded in Vvardenfell after 3E 414 were built in the traditional Imperial style. Daedric and Dwemer ruins dated to the early First Era are a common sight in Morrowind, both in Vvardenfell and on the mainland. The heavy curved vaults of the Daedric shrines are considered comfortable by the Dunmer due to their sturdiness, but outsiders regard them as brutal and oppressive. 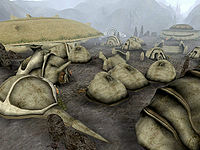 Argonian architecture in the form of bulbous, gourd-like mud structures flourished for a time in mainland Morrowind after the formation of the Ebonheart Pact and the freeing of Argonian slaves in the Second Era. A Redoran city in western Vvardenfell, southwest of Red Mountain. A Hlaalu city in the southwest area of Vvardenfell, on the Odai River. The seat of Imperial authority in Vvardenfell. Housed Vvardenfell's ruling Duke and Grand Council, as well the headquarters of the Imperial Cult and East Empire Company. A fairly large town on the northwestern coast of Vvardenfell. The volcano in the center of Vvardenfell, and the former capital of the Dwemer. A Telvanni city on an island in the archipelago off the eastern coast of Vvardenfell. A small Imperial city in southwest Vvardenfell. A major city off the southern coast of Vvardenfell and home of the god Vivec. Destroyed by the fall of the Ministry of Truth. A major Indoril city in southern Morrowind. A Redoran city in the Redoran district in northwest Morrowind. Became the capital after Almalexia was sacked. An underground complex created by Sotha Sil, a member of the Tribunal. An Indoril city east of Ebonheart. A city in the northern Telvanni district in northeastern Morrowind. A Hlaalu (formerly Dres) city in western Morrowind. An Indoril city in southern Morrowind. The capital of Morrowind up until 4E 5. A Hlaalu city in southwestern Morrowind. A Temple-controlled city on the eastern coast of Morrowind. A Dres city located south of Vvardenfell, on the southern coast of the Inner Sea. A Dres city on the southeastern coast of Morrowind. Morrowind was featured in Arena, Morrowind, and ESO. Only Solstheim was featured in the Dragonborn add-on for Skyrim, though parts of Vvardenfell and mainland Morrowind were visible. ^ Artisa Arelas' dialogue in Morrowind. ^ Mehra Helas' dialogue in Tribunal. ^ a b Adril Arano's dialogue in Dragonborn. ^ Cindiri Arano's dialogue in Dragonborn. ^ Madam Firilanya's correspondence mentions the Telvanni towers. This page was last modified on 7 March 2019, at 00:07.